New Delhi: Do you know that every time you're popping your favourite chewing gum in your mouth, you could actually be chewing a secretion from sheep's wool? Yes, that's right! It has been found that chewing gum contains lanolin, which is a waxy secretion from the sebaceous glands of the skin of sheep. Its function is to make sheep's wool waterproof. For this reason, lanolin is generally an ingredient in skin products, which is fine. But what about using it as an ingredient in chewing gum? The innocent-looking chewing gum might not be as innocuous as you thought, says, Dr Saurabh Arora, founder of Food Safety Helpline. Moreover, since lanolin is present as a component of chewing gum base (the rubbery substance that imparts the "chewable" characteristic to chewing gum), which is regarded as standardised, manufacturers do not need to reveal its individual ingredients. What goes into making a chewing gum? Chewing gum is typically composed of gum base, softeners, sweeteners and flavours. These are briefly discussed below. * Gum Base: As indicated above, the gum base is rubbery in nature, and used to be derived from latex sap (called chicle) of the sapodilla tree. Other natural sources includegum Arabic, natural resin, food grade agar, Chiku, Ghatti, Jhingan, Khair etc. As has been indicated above, there are many components of gum base (besides lanolin) that remain unknown to the consumer, since the manufacturers have no intention to declare them, in the absence of any strict regulations forcing them to do so. * Softeners: As the name suggests, the primary function of this component is to maintain a "soft" consistency of the gum so that it is appealing to the consumers. This component helps to retain moisture and prevent the gum from hardening. The most common softeners are glycerin and vegetable oil. - Mint flavoured chewing gums e.g. Wrigley's Spearmint, Wrigley's Doublemint; Eclipse Mints; Extra Mints etc. What are the various varieties of chewing gums? What do the regulatory agencies say? The major international agency on food safety and standards is the Codex Alimentarius, which has fixed the maximum levels (in mg/kg) of various food additives in chewing gum. The Food Safety and Standards Authority of India (FSSAI), the apex food regulatory authority in India has fixed the chemical composition and maximal levels (in ppm) of the various food additives in chewing gum/bubble gum. 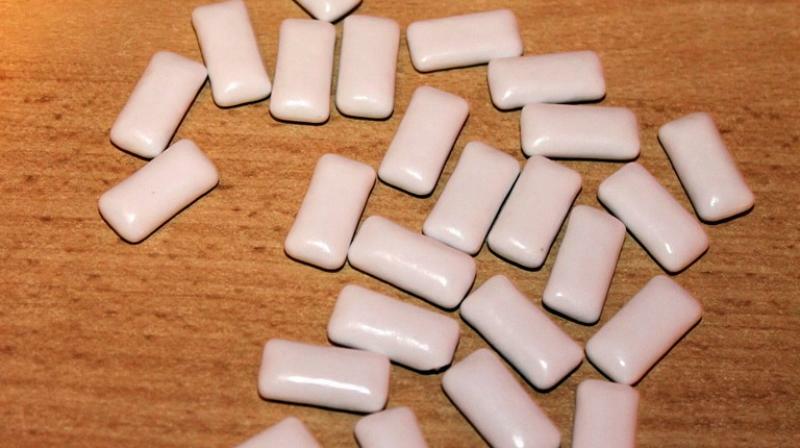 Are there any health hazards from chewing gums? - Chewing Gum Can Trigger Temporo- Mandibular Joint Disorder (TMD): The temporo-mandibular joint is the joint that connects the jaw bone (mandible) with the temporal bone of the skull. Excessive chewing can cause differential contraction of the muscles, particularly if you chew more with one side of the mouth as opposed to the other. This can trigger TMD, which causes chronic pain, tightening and inflammation of the jaw muscles, ear aches, tooth aches, as well as migraine-type headaches. Chewing Gum Can Cause Gastrointestinal Problems: Chewing gum increases the air intake into the gastro-intestinal (GI) tract, which can cause abdominal cramps and bloating. It can also aggravate the condition in patients suffering from irritable bowel syndrome (IBS). Peppermint flavored chewing gum can cause gastric acid reflux. Also, popping a chewing gum into the mouth immediately causes the brain to send signals to the digestive system to be prepared to expect food intake. As a result, saliva and other gastric juices, including gastric acid starts to be secreted. Since, there is no intake of food, this actually may compromise your ability to digest food due to lack of digestive juices, when you actually consume food. This can cause indigestion. Some chewing gum sweetened with artificial sweeteners can cause diarrhea. - Chewing Gum Can Cause Tooth Decay: Consumption of chewing gum sweetened with sugar essentially coats your teeth with sugar, which leads to tooth decay. Besides tooth decay, dental erosion can also occur. Dental erosion occurs by cumulative decalcification, which slowly erodes the teeth. This can occur even in the presence of artificial sweeteners, since they contain acidic flavorings and preservatives that can erode the teeth, in spite of the presence of xylitol that fights cavities. - Chewing Gum Can Release Mercury from Dental Fillings: Amalgamated dental fillings typically contain silver, mercury and tin. Chewing releases mercury vapors from the fillings, which can be rapidly absorbed into the blood. Although the amount of mercury is minute, you wouldn't want to contaminate your system with mercury, however small. The foregoing discussion highlights the composition, varieties and health hazards of chewing gums. Although primarily the deleterious effects of chewing gums have been highlighted, it may be added that chewing a piece of gum after a meal could be a healthy habit - the saliva released helps to clean the teeth and the flavour can add freshness to the breath!